The following interview is with Steve Persia an attorney and certified NFLPA agent with Roetzel & Andress in Cleveland, Ohio. Connect with Steve on Twitter and LinkedIn. Steve Persia is a Clemson University graduate where he majored in history and business administration. He earned his Juris Doctor from the University of Toledo College of Law in 2004. Currently, Steve is an attorney at Roetzel & Andress in Cleveland, Ohio where he focuses his practice on civil litigation, with an emphasis on general liability defense, toxic tort, and transportation litigation. Further, Steve is heading his firm’s new sports law practice group, focusing on recruiting and providing services to NFL players. In 2010 and 2011 Steve was named an “Ohio Rising Star” by Law and Politics magazine, Columbus magazine, and Cincinnati magazine. Josh Corriveau: Did you have prior experience in the sports industry? Why did you decide to sit for the NFLPA exam and become a certified agent? Steve Persia: I played basketball in college for 2 years. Obviously now, I prefer football, even though I didn’t play it in college. I decided to sit for the NFLPA exam because I had some good friends in the NFL and most of them were playing for the Cleveland Browns. It was something that they always mentioned to me and that they thought would be a good fit for me. I started talking about it probably about 5 years ago, but just got certified last year. That was part of it. The other part of it was Roetzel & Andress is a national law firm and we do just about everything. And, the thing we don’t have is a strong Sports and Entertainment practice. Trying to build that practice on behalf of the firm was a goal of mine in doing this. The firm has been positive and very supportive. It is a little different for Roetzel & Andress because we didn’t really have that before. They have been very supportive of it and it has been nice to have the Roetzel & Andress name behind me. I mean I really operate as an individual in a lot of respects. I am the only certified contract advisor at the firm. We do have some other lawyers that do work with athletes on the marketing side and compensation deals, but you kind of get the best of both worlds with me. On the one hand, we are a huge firm with a lot of resources. On the other hand, we offer close personal attention that a player being represented by a bigger firm may not get. I also think it is important to diversify your experience, which is what I have been able to do with my sports practice. Josh Corriveau: What is a typical day like for you as both a practicing attorney and an agent? How do you balance your firm’s needs, as well as your NFL client’s needs? Steve Persia: I mostly represent and defend Fortune 500 companies in litigation matters. My NFL clients aren’t much different than my corporate clients. It is a slightly different service being provided, but at the end of the day, much of my day is responding to issues for both sets of clients, whether it is an NFL player or whether it’s one of my corporate clients. Each has their own issues that surface everyday and then you have to deal with them. I think from that standpoint, there really isn’t a big difference between the two, whether it’s billing hours or talking to an NFL team. The bottom line is, you are doing the same thing, providing a service on behalf of your client. As an agent, sometimes you are going to have to drop what you’re doing to talk to a team, or to talk to your client if he gets cut or injured, or to negotiate a contract. Having hundreds of lawyers at our firm to help cover matters has been helpful. Josh Corriveau: What players have you worked with previously? What players are you currently representing? Steve Persia: In 2013, I had three guys that I signed to NFL contracts; Elliott Mealer who was an offensive linemen from the University of Michigan that signed with the New Orleans Saints; John Rabe who was a tight end from the University of Minnesota that signed with the Pittsburgh Steelers; and D.J. Monroe from the University of Texas who signed with the Tampa Bay Buccaneers. In 2014, I have signed six guys. I represent Jasen Carlson, an offensive lineman from the University of Buffalo; Trevor Foy, an offensive tackle from Purdue; Beckett Wales, tight end from Syracuse; Zack Craig, a safety from Oklahoma State; Andrew Suter, a long snapper from Oklahoma State; and Adam Dempsey, a defensive tackle from Cincinnati. Josh Corriveau: What was the first contract you negotiated? What was that experience like? Steve Persia: The first contract I negotiated was for Elliott Mealer with the New Orleans Saints. 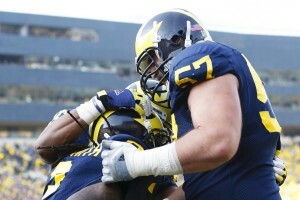 Elliot was an offensive lineman who played at Michigan and in the 2013 NFLPA Collegiate Bowl. He signed immediately after the draft was over. It was an interesting experience. The negotiations were pretty simple. I had all the information from the NFLPA to procure a favorable signing bonus as an undrafted free agent for him. It worked out well because that’s where Elliott really wanted to go. We talked to them quite often before the draft. That was the team we thought that was the best fit for him. The Saints were great to deal with. They were very professional throughout the process. Josh Corriveau: After your first major recruitment pitch, what are some things you learned that will help you moving forward? Steve Persia: First, I learned that size matters in the NFL, it really does. Production at the college level matters to an extent, but if you do not have the size they are looking for the chances of playing at the NFL level are severely hindered. That was not something I was really cognizant of going into this. The other is that you have to identify and recruit the right players. I know in that instance “right” is a pretty vague term. But, you really have to spend time recruiting players that you have a chance at signing. For me, I like to go after players that I believe have a good head on their shoulders and have a good support system around them. Those are the types of players that recognize the value that I add to their representation. As opposed to players that are only concerned about which agent will give them the most money before the draft, or which agent will give them the nice car or best training facility slot before the draft. If I call a player and his first question to me is “what will you give me?”, chances are, it isn’t going to be a good fit. For either of us. The major challenge that “we,” meaning those who don’t have a laundry list of clients or that are not part of a huge sports agency, is the money. It takes money to get licensed. There is more to it than just the NFLPA fees. You have to pay state fees, insurance, and recruiting expenses. Recruiting against money is difficult. Unfortunately, this business for most involved is not so much about signing with an agent who will do the best job for you. It is turning into a system where players are signing with the guy or firm that will give you the biggest marketing guarantee or largest stipend. In my opinion, that is not the way to start a player-agent relationship. Competing against an agent who is prepared to offer a marketing advance or other incentives is the most difficult aspect of recruiting and therefore the biggest challenge. Josh Corriveau: Currently, there are a small number of top agencies with many clients, and very few small firms that can compete. How can a “solo agent” survive in this competitive market? Steve Persia: It is tough, but it can be done. I think the marketing guarantees are a joke. The NFLPA regulations say that you cannot provide any type of inducement to a player or his family to sign a player. How that is not considered is not considered an inducement is beyond me. Again, it is tough, but it can be done. You have to identify the right player and build that relationship early. You have to get to know their family, their interests, and stay in constant communication. The more contact you have with that person, the more they’re going to learn that they’re not just another number to you and you’re not a guy that just goes down the list until they get somebody and moves on. Josh Corriveau: Where do you see your agency work and your firm’s new practice group in the next few years? Steve Persia: We have a new associate in our Cleveland office that we are talking about getting certified as a contract advisor. Ideally, I would like to see my NFL work become the primary aspect of my legal practice within the next few years. Josh Corriveau: What type of services do you provide your clients? Steve Persia: The good thing about our firm is that we are a full service law firm. But, we do not do anything on the financial side. I will make recommendations to my clients. I will recommend NFLPA certified financial advisors that I trust, but that’s about it. It still baffles me that kids sign with agents that have a track record of losing their clients money through poor financial referrals. Outside of the financials we can do anything. We can do tax, real estate, and general legal matters. A lot of agents out there are not lawyers, but advertise that they can provide legal services. We can actually provide legal services. Josh Corriveau: How is your position as an attorney advantageous to recruiting clients and providing representation? Steve Persia: I think that being an attorney is advantageous to recruiting without question. This goes back to recruiting players that have a head on their shoulders, solid support structure, and good influences in their lives. Individuals that are wise enough to recognize the value that a trained lawyer can provide. A lot of us have practiced in front of Federal Judges who are appointed by the President and that can throw us in jail at a drop of a hat. After you’ve dealt with that for several years, you aren’t likely to be intimidated by a General Manager of a football team. I am not saying you have to be a lawyer to be a good agent. I know good agents that are not lawyers, but I do believe that being an attorney provides you with an advantage. One of your primary jobs as an agent is to negotiate a contract. Subsumed within that role should be being able to advise your clients as to the legal ramifications of what is included in the contract. Trained lawyers can do that. Josh Corriveau: What advice do you have for law students or others that want to pursue a career as an agent? Steve Persia: The one piece of advice that I would say is that it would be smart for someone coming out of law school to actually get some legal experience before venturing into the sports field, unless you get a job with a reputable agency out of law school. Get a couple years of experience as a lawyer, get experience speaking in front of people and negotiating contracts. Those are not areas that you become fluent in during law school. The second thing I would say is you have to be realistic when you’re starting in this profession. It is not realistic that you are going to get 5 guys on a 53-man roster in your first year as a solo agent. Can it happen, sure. But, the chances are very slim. You have to be realistic, but at the same time be persistent with your efforts. Josh Corriveau: On behalf of SportsAgentBlog.com and all of our readers, I would like to thank Steve Persia for taking the time out of his busy schedule to share his experiences as an agent, as well as his knowledge about the football industry.